Point Amour Lighthouse, the tallest in Atlantic Canada, is along the Labrador Coastal Drive. 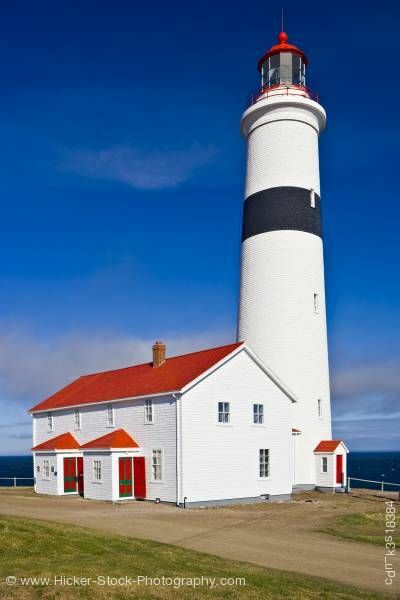 This stock photo shows Point Amour Lighthouse, a Provincial Historic Site at Amour Point in L'Anse-Amour, along the Labrador Coastal Drive, Highway 510, Strait of Belle Isle, Viking Trail, Trails to the Vikings, Southern Labrador, Labrador, Canada. Beautiful round lighthouse painted white with a large horizontal black stripe. Three windows sit evenly one over the other in the lighthouse tower. A small entry way is added to the tower. The door and roof are painted red. Attached to the lighthouse is a two story white building with a bright red roof. The front of the building has two additions attached also have a red roof and red and green doors. Point Amour Lighthouse, a Provincial Historic Site at Amour Point in L'Anse-Amour, along the Labrador Coastal Drive, Highway 510, Strait of Belle Isle, Viking Trail, Trails to the Vikings, Southern Labrador, Labrador, Canada. Built in 1857, the Amour Lighthouse is the tallest lighthouse in Atlantic Canada and 2nd highest in Canada.